L-R: Greg Loska, Rusty Gardiner, Pawel Ratajczak, Danielle Brisson, Richard Cote, Roch Chalifoux. 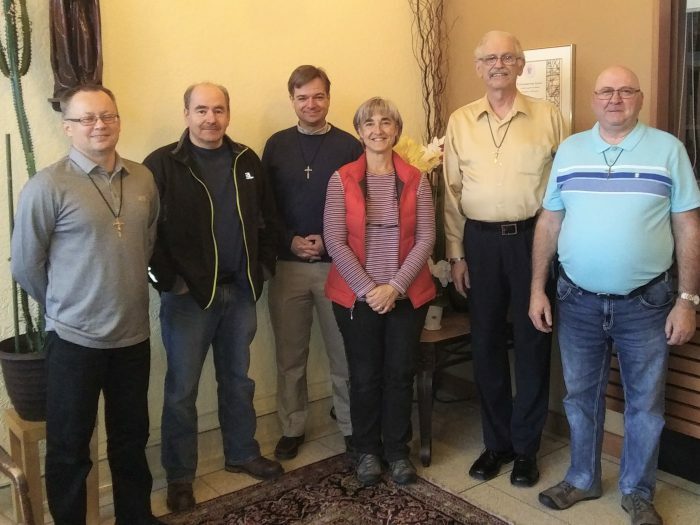 A meeting of Brothers representing the U.S./Canada Region met November 10, 2018 at Queen of Apostles Retreat Center, Mississauga, ON. As mandated by CROCUS, this meeting brought together a Brother representing the following Provinces: U.S., Br. Richard Cote, OMI; OMI Lacombe, Br. Rusty Gardiner, OMI; Assumption, Br. Grezegorz (Greg) Loska, OMI; and Notre Dame-du-Cap, Br. Roch Chalifoux, OMI. The meeting began with brief introductions. The translation was provided by Br. Richard and Mrs. Danielle Brisson, Executive Secretary of CROCUS. Afterwards, Fr. Pawel Ratajczak, OMI of the Assumption Province facilitated the meeting. A questionnaire was distributed beforehand that contained three headings: The Present situation, Formation and the Future. A list of questions for reflection/discussion were included as bullets to the three headings. The present situation in OMI Lacombe: 7 Brothers (4 active). Ministries include: Street Ministry, Chaplaincy and Funeral home outreach. Assumption Province: 3 Brothers (1 active) in Parochial Ministry. Notre Dame-du-Cap Province: 10 Brothers (1 active), Ministry-Director of OMI residences in Ottawa. U.S. Province: 16 Brothers (7 active) in various leadership roles. As to formation, Brother candidates should follow the U.S. lead in having candidates follow the same Theological formation as the Scholastics. Formation Directors should also develop a program of formation leading to technical, professional and pastoral service as mandated by our CC.RR. Hope for the future would include, as much as possible a Brother in Formation Ministry at least at the Pre-Novitiate level and be invited to participate in Come and See weekends. Lastly, the brothers were asked to submit a name to CROCUS to represent the U.S./Canada Region on the Standing Committee of Oblate Brothers in Rome. The meeting ended with a fraternal social hour in the evening.